Information about a few projects in reverse chronological order. (Updated Feb 2015). The project as described further down this page headed "Exploring complex data sets..." has morphed into the development of a tool to research 'exploration' and to explore the role of affect and personal preferences on engagement. The tool is called iFISH (long story - read this paper (pdf) to find out how this came about). You can play around with some of the applications of this idea on the iFISH Project Page. 2011 - 2013: This peer review system is now supported by an OLT (previously ALTC) project. This involves re-designing the PRAZE tool and supporting its use, and peer review generally, around Australia. Plenty on information on the Student Peer Review web site. July 2011: PRAZE recently won the University of Melbourne "Norman Curry Award for Innovation and Excellence in Educational Programs" and even more recently won the National Australian Learning and Teaching Council Award for "Innovation in Curricula, Learning and Teaching"! "PRAZE" is a project to facilitate the widespread adoption of electronically managed anonymous peer review in diverse subjects across the University. The software has been running internally since 2008 and we are looking at making it available outside the University. Further information on the PRAZE site. For a conceptual understanding of the peer review process, this animation might help (click in the video to move through the animation when it stops). There are many benefits to be gained by students forming collaborative partnerships with other students in different schools. Even more exciting is the possibility for these schools being quite remote from each other - such as in indigenous communities in the far north of Australia and in overseas countries such as China. The challenge is in forming the student-to-student partnerships. How can you, as a student, choose someone to work with when you don't know them or their skills? We are using innovative technology (iFISH) to help students form these groups based on their personal preferences, or information that they know about what they like. We are working with students in local primary schools, secondary students in north-western Australia, as well as in China. 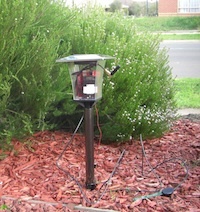 Run the online software at: smartgardenwatering.org.au (it is now hosted on the savewater! Alliance web site). For more information, go to the Project page. This project is continuing into 2011 from 2007, 2008, 2009 & 2010! Our latest development (2013): We now have an iPhone app to remind you of when to water and to show you the last 7 days of rain in your local area. We have also expanded the coverage of SGW to the whole of Victoria and added plant's "cold sensitivity" to the database. 2011 update: has been to improve this online application and form an online social network of people exploring ways to save water in their gardens. We have moved from creating a useful tool to encouraging the significant impact of that tool in the local community. We now let people save their garden models, find other models using a Google-map interface, and encourage communication between gardeners. We later plan to use real-time Bureau of Meteorology data to refine the watering suggestions. We even have an iPhone app (December 2011). April 2011 update: the new SGW 2.0 was launched at the Melbourne International Flower and Garden Show by Arron Wood. Watch the video of the launch! October 2009 update: we were also finalists in the National 2009 saveWater! awards, sponsored by Savewater, but didn't win that either! Details here. Some more information about this project is available below. An IBES supported project exploring the use of remote monitoring of data in the garden. We have developed a device that sits in a garden, monitors ambient temperature, soil temperature, soil moisture, humidity and light, as well as the GPS location of itself. It transmits these data to a database via the GSM network. We are exploring this in conjunction with apps on mobile devices to give more refined advice to gardeners about how to vary a watering schedule given local weather and local garden conditions. The purpose of this research (funded by the Victorian Smart Water Fund Round 3) is to enhance knowledge of the performance of technologies used for garden watering. This includes technologies such as the use of mulch to retain moisture, soil wetting agents and various irrigation systems. The information that is obtained will be used to improve communication between water businesses, nurseries, irrigation suppliers and the community. Our role in the project was to build on research done by the Department of Resource Management and Geography (Connellan, May, et al) in which explored horticultural issues relating to garden watering (use of mulches, soil types, watering systems, plant water demands, etc.) and develop the software technology end of the project (design of user interface that engages people with the task of watering their gardens in a considerate manner, and to model the performance of a water tank in their garden). 2009: the project has now become iFISH - see "Current projects" above. This project addresses the challenging problems of using online environments to offer advice relating to complex sets of data. The challenge is to maintain a user’s engagement in the system long enough to explore possible outcomes in a system that is not completely deterministic and offers no single right answer. The approach will use knowledge of engagement and flow to produce and evaluate a prototype application that will help students to explore the range of subject offerings that might be suitable to them at this university. Linguistic analysis will be used by the system to help determine a suitable range of outputs that maps onto an individual’s interests. The research draws on issues related to affective computing, engagement, flow, interactivity. In 2008 research is ongoing in the context of student subject choice. A Flash front-end to a database (not now working properly in 2012!) is being constructed that allows a playful exploration of data using multiple sliders. We are also creating a generic version of this that allows the input of a predetermined 'tagged' dataset (mock-up versions to explore can be accessed here). Draft paper explaining some of these ideas. This project (see below) was actively being developed in 2007 and 2008. In 2007a team of 3rd year CSSE students implemented automated tracking of objects using video image recognition. This project explores the use of interactive, online support for citizens to access e-government services. A prototype online tool was developed to allow the user to explore scenarios in order to explore how various personal factors might affect the chances of finding work. You can read the summary of the report on this project or a paper presented at OzCHI 2006. This Java software for the analysis of video data (in a physics learning sense) was completely re-written by a team of 4th year CSSE students in 2005. In 2006 three programmers have continued (slowly) the development (Chandika Jayasundara, Stewart Gleadow and Sadat Rahman). This research seeks to add to our understanding of the use and design of interactive online learning tasks. It will add to the literature on flow, its measurement and its impact on learning. It will broaden our understanding of how the control a user has over interactive software influences flow and learning. This will have significance to the education community, which seeks to improve online learning techniques, the HCI community, which has interests in interaction design, as well as the psychology community, which has interests in flow and motivation theory. More info can be found on my Research page. I am also still involved in some online physics learning Web sites with the School of Physics - yet to be released to the world! Also developing other on-line learning resources with School of Physics. "Web learning portal" - an entry to learning resources for students in the Faculty of Science. An investigation of on-line learning environments for our department (Information Systems). Exploring QuickTime streaming video for use in teaching. Pearce, J. and Livett, M.
This development project (funded by a National Teaching Development Grant) is the continuation of a 1996 CAUT-funded project to develop an on-line learning environment for first year physics students. It involves the further development of a sophisticated Java video-analysis tool (MotionWorkshop) incorporating a spreadsheet. This particular stage of the project involves developing the spreadsheet for use as a numerical modelling environment. Pearce, J. & Rodrigues, S.
This Small ARC funded project is researching the learning strategies employed by students using video-analysis software in a physics laboratory compared with students using a more traditional computer-based data-logging laboratory exercise. Michelle Livett, Jon Pearce, Robert Scholten & David Jamieson. Funded internally by the University of Melbourne TLMETC for 1998). This project aims to produce on-line resources for first year physics students. It is still under development (Feb 99) and is designed to run from within the WebCT authoring environment. You can have a look at some of the material at this duplicate site. A philosophy of this material is to make all the screens highly interactive. This is achieved by requiring student to write predictions on paper about what they think will happen before they run each of the various interactive elements. These elements make use of QuickTime movies, Flash animations and ShockWave simulations. In particular, have a look at the ShockWave simulation Magnetic Field Trip to help students develop ideas of changing magnetic flux producing an induced current or voltage (make sure your browser has the ShockWave plugin installed). the whole package is designed to be platform independent and to run across a (fast) Web connection. The project has continuing funding from CUTSD and was still ongoing during 1998. Jon Pearce & David Jamieson. Funded by the Committee for the Advancement of University Teaching (CAUT). (see the "paper at OzCUPE2" on this; 1994).During 1996 part of this project was re-written as a Web document. Have a look at the Webby part of the project (the other part of the project, the simulator, you have to run directly from a PC - sorry! ), but the animations will take a while to load from a remote site! This project Improving Learning in Physics By Engaging Undergraduates in Current Research is aimed at second year students learning about the structure of matter and, in particular, the physics behind a piece of research equipment know as a Nuclear Microprobe. It has two parts: a tutorial part, which essentially replaces lecture content with a sequence of questions illustrated with QuickTime animations. The other part (shown below) is a sophisticated simulator which enables students to "play" with both simulated and research data from the microprobe. This little piece of Macintosh software was written to enable a fellow lecturer display the relationship between position, speed and acceleration graphs in her lectures. It simply displays the three graphs and allows you to vary the initial values of s, v and a by dragging the lines on the graphs using sliders. The graphs update in real time. It is planned to extend the software to display other relationships in a similar manner. Please download svaPlot and let me know if you find it useful.